New conferencing accounts are now being setup via Zoom. ReadyTalk support and billing via ITS will continue for existing customers for the time being. If you plan to continue to use ReadyTalk, please contact ReadyTalk support directly to begin a direct billing agreement. Set up a conference call with more than 2 off-campus participants or multiple on campus participants by using ReadyTalk. If you have less than 2 off-campus participants or less than 6 on-campus participants, it is possible to use your campus phone for teleconferencing. See UCSC Telephone conference calling. ReadyTalk is a UC wide conference service provider. The discounted rate is less than 3 cents per minute per participant. ReadyTalk is a "pay as you go" service with NO one-time sign-up fees or recurring charges. Maximum of 99 participants. If you have more participants, contact ReadyTalk at (800) 843-9166. Deliver visual content and interactive presentations at your meeting while using teleconference features on our campus phones (up to 6 campus participants). These users can be audioconferenced by using UCSC Telephone conference calling. Video Conferencing is included in your existing web conferencing subscription at no additional charge. More information about ReadyTalk Video Conferencing. Four simultaneous video conferencing feeds which can be shared by chairpersons, co-presenters, or participants. 25 participant capacity for viewing the video feeds. Chairpersons and co-presenters can actively manage the shared video feeds. ReadyTalk allows users to record and archive their conference calls for a fee. Note: When using ReadyTalk archiving, be aware that storage costs add up quickly. Recordings can be saved locally to avoid storage costs. If you have a legitimate reason for using ReadyTalk Archiving, store only what you need and delete archived recordings as soon as you are done with them. See ReadyTalk's Recording Management Guide for more information. ReadyTalk is a "pay as you go" service with NO sign-up fees or recurring charges. All ReadyTalk charges are billed back to the faculty/staff assigned campus telephone number and will be reported on the ITS Monthly Billing statements. The ReadyTalk Audio service is .017 cents a minute plus a 5.4% surcharge from Network Services. The ReadyTalk Web service is .027 cents per use. The UC ReadyTalk agreement has expired and new account requests for conferencing are now fullfilled via Zoom. Visit the ReadyTalk Web site, for complete instructions and training guides. 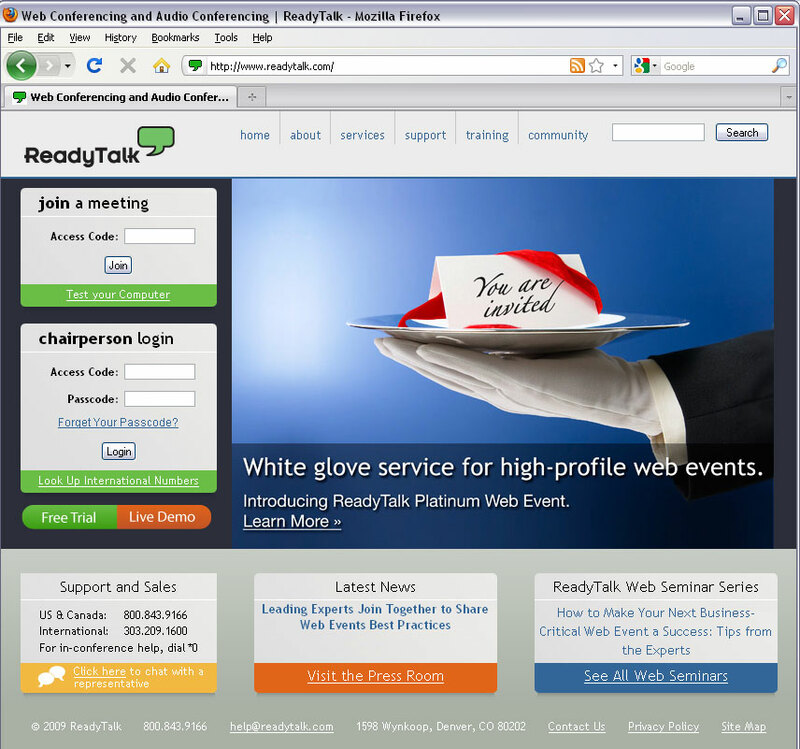 The ReadyTalk website is the conduit for your audio and/or web conferences. Participants will join meetings by entering the ‘Access Code’ that was provided to them by the Chairperson.